Every day, the Abyss claims more Supernal knowledge, more lore is lost to the steady crumbling of history and to the mortality of the Awakened. There are those who claim that mages should be looking to the future, but how can they, when they have allowed so much of the past to be lost already? What good does new avenues of learning do if they cannot hold onto what is already known? The Mysterium stands against that crumbling and preserves the lore of the scions of Atlantis. 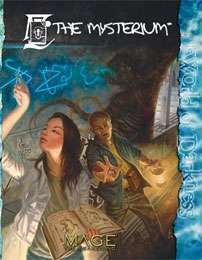 Whether they are dedicated scholars peering into long-forgetten secrets in dusty libraries or two-fisted adventurers looking for traces of the Supernal in mankind’s archaeology, the Awakened owe the Mysterium much for the preservation of their lore. • A comprehensive examination of the origins of the Mysterium, stretching back into the misty legends of Atlantis. • Details of how the Mysterium approaches its Supernal mandate to gather and preserve all knowledge, as well as the secrets of the Atlantean Mystery tradition at the core of the order. • A variety of new spells, artifacts, imbued items and legacies for use in your Mage: the Awakening chronicle. This title was added to our catalog on September 26, 2007.